I may have been the last one of my high school friends to own a pair of Mavi jeans, or to get the memo that cargo pants were no longer cool (for girls, at least), but I do like to think that I was always a trendsetter when it came to food. When I moved to the city in 3rd grade I had a lot of catching up to do. Those precocious Upper West Side kids were already dipping baby carrots in hummus after school and wearing ripped cut-offs (the 90’s were a roller coaster ride for denim, and I never could keep up). But my biggest revelation as a wide-eyed Suburban bumpkin (in a Laura Ashley sweater set) was sushi. I was always an adventurous eater. But I had a separatist blue-plate-special mentality. So the idea of fish, rice, and seaweed, not only touching, but being consumed in one bite, was pretty crazy. But as it turned out, I loved crazy. So much so that I got even more creative and wild with maki madness. Though I was head over heals for California and salmon skin rolls, being an eternal condiment junkie, the item I loved most on the sushi menu was the carrot ginger dressing. I used to ask my babysitter if we could buy a tub of it to take home with us after a meal. She used to scold me when my salad was all gone, and I would try to eat the remaining dressing in the bowl with my chopsticks. (In fairness, on the spectrum of table manners, this is pretty close to belching in a crowded restaurant while licking the chicken grease off your fingers…and I had come so far since 1989). It’s not surprising that sooner or later, one thing lead to another, and I started dipping my maki rolls into the wayward carrot ginger dressing. And once my friends witnessed this and tried it for themselves, the trend spread faster than knee socks in the post Cher Horowitz era. Once I was in college, on days when I wasn’t eating my weight in chicken fingers, I would go to Meeting Street Café and get a chicken and vegetable plate with a side of ginger-tamari dressing for dipping. Their version was remarkably similar to the orange Japanese sauce of my childhood. And soon enough, my friends began forgoing their bacon grilled cheese sandwiches for bun-less delights and a boatload of carrot ginger dressing. Needless to say, I still order my sushi with an extra side of dressing. But now I also make my own version at home and put it on everything from rice bowls to chicken tacos. 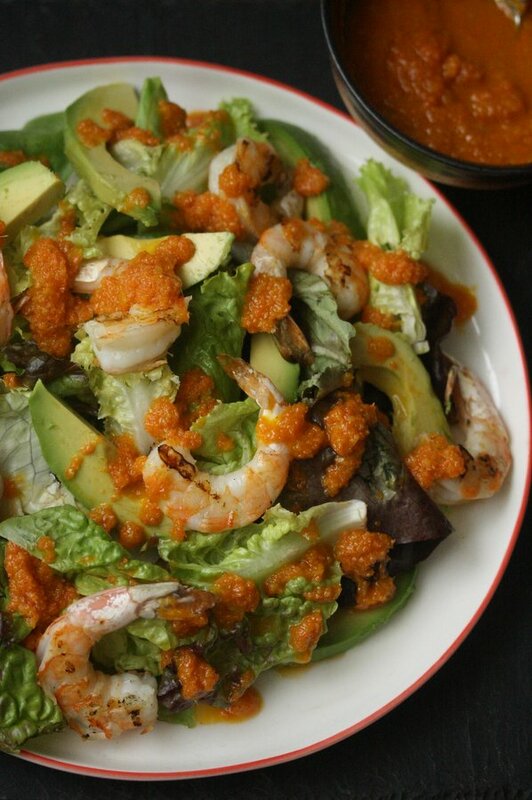 Recently, I used it to top this grilled shrimp salad, which is kind of a classy version of the torn iceberg with shredded carrots and avocado that I used to get at Sakura restaurant. 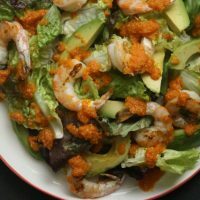 It may not be as hot right now as a kale Caesar, but like a good pair of Levi’s, this grilled shrimp salad recipe with carrot ginger dressing can stand the test of time and never fail to satisfy even the trendiest of taste buds. 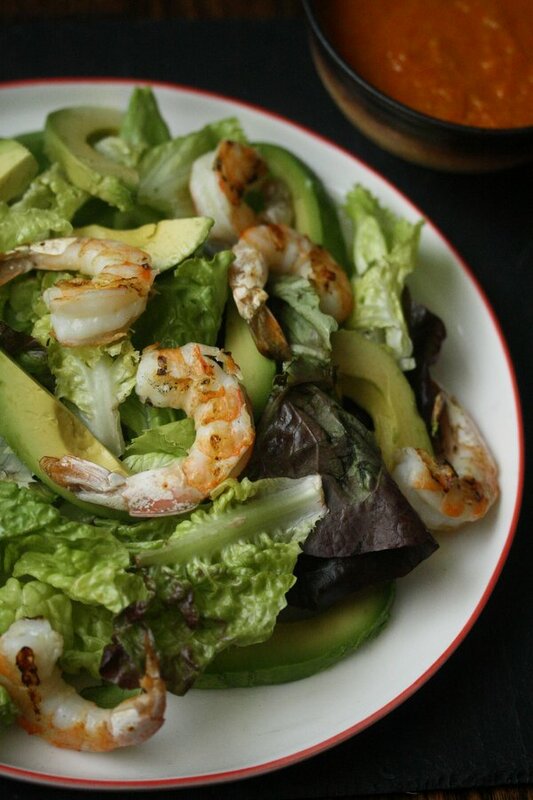 This healthy grilled shrimp salad recipe is a quick and easy summer dinner. 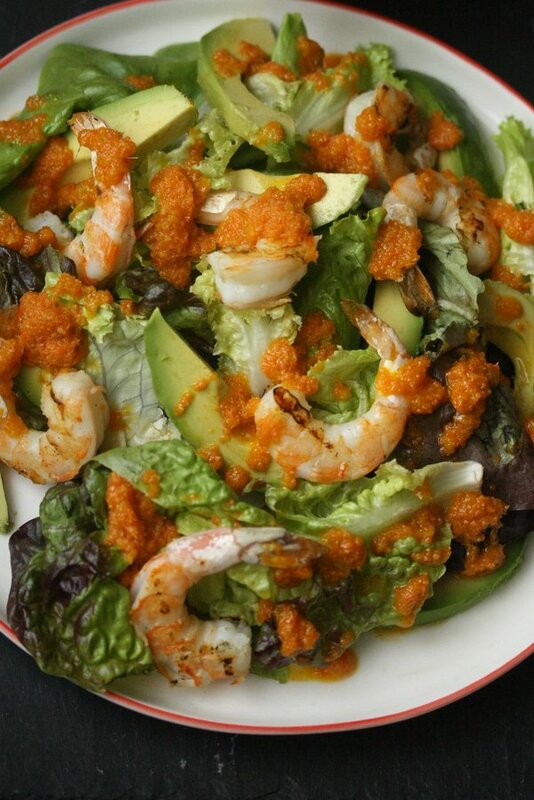 It's topped with avocado and a gluten-free Japanese carrot ginger dressing with sesame oil. Combine all the ingredients for the dressing in a small food processor or blender. Puree until smooth. Add more water as necessary to get a smooth texture. Set an indoor grill pan over high heat or light a charcoal grill. 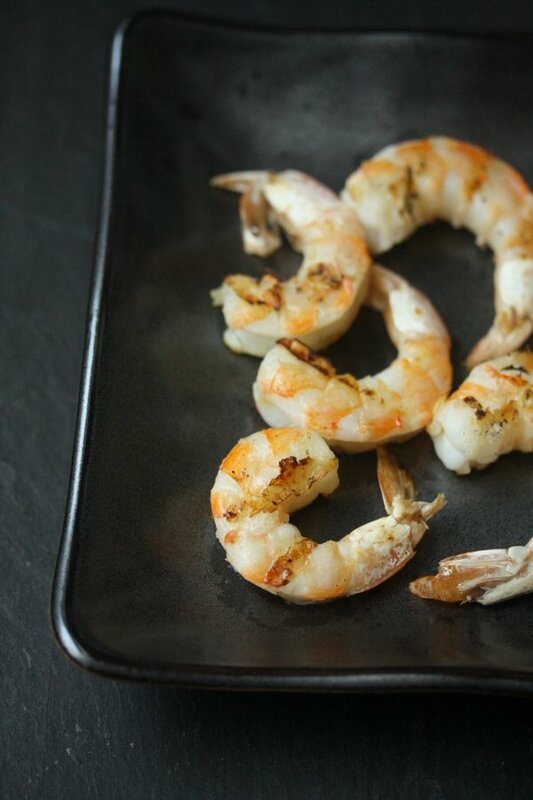 Season the shrimp with salt and drizzle lightly with olive oil. Grill the shrimp until pink, curled and charred, about 2 minutes per side. Remove to a plate. Arrange the lettuce on a platter. 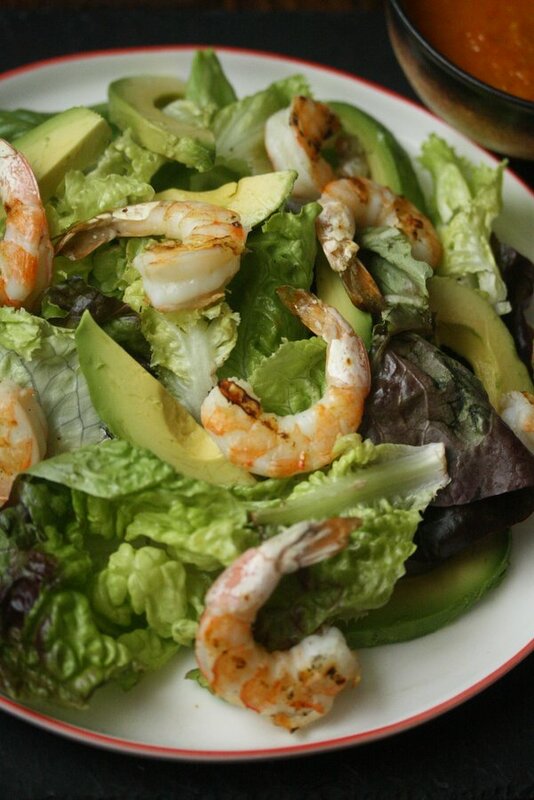 Scatter the avocado slices and grilled shrimp on top. 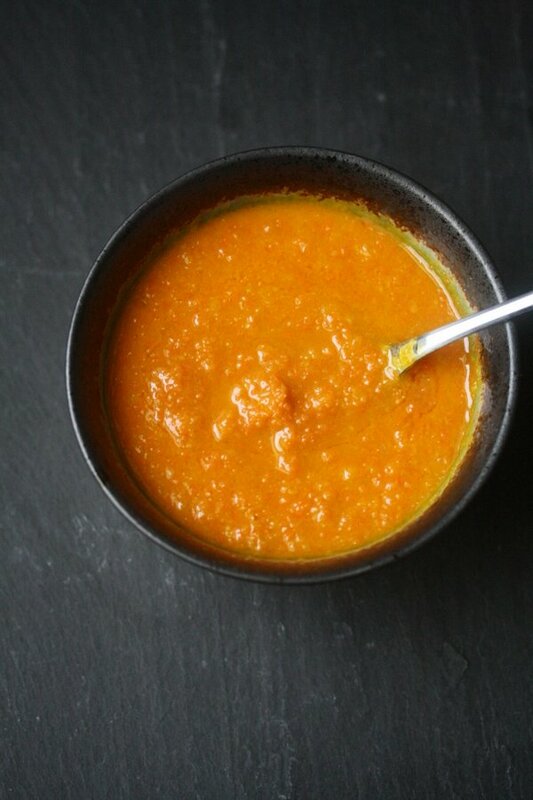 Drizzle with the carrot ginger dressing and serve immediately. Dressing can be made up to two weeks in advance. I always wanted to know how to make this dressing! Thanks, Phoebe!